Rally motorsports blog of 3 time US Production rally champion and 1998 IMSA Speedvision Cup Champion Steve Nowicki and his spectacular co driver, multiple champion, Jimmy Brandt. This Blog will evolve with recent events and other racing activities from the other side of the fence, the spectator or volunteer side. Should I stay or should I go.....rallying! Looking for interested crew members to help out. Special Stage 20, Bonfire Alley. Last stage of the 2014 event. In car - compare to last year, much quicker in 14....less fire in 14. Steve Nowicki/Scott Rhudy camera on top of car. Will update with more information as it comes available. Team finished second day of this years event 7th in class, 19th overall in regional competition in very difficult driving conditions! Another Normal Rally Weekend - This time in da UP, eh? Two days, two regional rallies: Friday - which ran into the evening, the Nowicki/Brandt team finished a disappointing 7th of 19 in class in the Ottawa Rally. Disappointing because 6th place was just 3.2 seconds ahead, and dropped us on the last stage, and 5th place was just 8.7 seconds ahead at the conclusion of the competitive stages. Saturday's event, the Lac Vieux Desert Rally, was a slight improvement, with a 5th in class of 15 entries, losing out to a 4th place finish by just 10.1 seconds. There was some rally drama. Before those minor details, I must say that the trip to Michigan's Upper Peninsula was quite amazing. One hour out of Houghton, towing with the rig was one of the most peaceful drives in recent memory. So relaxing, at a quiet and leisurely 60 mph pace on billiard blacktop, sun evolving into dusk, fall visuals in the air, rich, fresh and previously unheard music in the cabin, all the tension, stress and worries of a long day were put to rest. UPon arrival at the cabin I didn't realize that the weekend accommodations also purchased a full moon over the calm waters of Keewenaw bay. A fantastic start to a weekend up north where cell coverage was spotty and email traffic was iffy. Lovely. Michigan Tri-Fecta - and Jimmy is Back! While waiting for the UP to secede from Michigan, Jimmy Brandt comes back from his bike (as in motor bike) riding adventures and gets prepared to co-drive once again with Steve Nowicki, this time in the Lake Superior Performance Rally, just south of Houghton, Upper Peninsula. Last minute covert operations kept entry details to the bare minimum, but it has been understood that the pair will once again compete in the trusty Mitsubishi built Fire Arrow, which was sold by Plymouth dealers in the USA THIRTY THREE years ago. Typically a "home" rally for Nowicki, who was born and raised in Wisconsin, south of the line bordering the two states, this will be the first time since 2000 that he has returned to run the event formerly known as POR, Press On Regardless. Last time, Nowicki and David Stone finished 8th overall and First 2 wheel drive in his Mazda RX-7 while winning the Group 5 class in the event. This year, 13 years later, Nowicki and Brandt will be contesting the regional portion of the rally in Group 2, the biggest group or class of cars in the whole rally with 23 entries as of this date. Needless to say it should be a hoot in Houghton. The car is prepared and now ready to go. After the last event, Magnum Opus, some serious performance issues were discovered which were thought to be the engine going south. After the summer break of outdoor activities, cooler heads and cooler weather prevailed, and the exhaust system was inspected, thankfully to find a clogged flex tube and catalytic converter! $50 bucks later and the car now runs a whole lot more respectable, and it appears that the engine is actually going north now. An engine oil change, other minor repairs, a new exhaust tip, and some new stickers to add coolness and viola, rally time is near. Look at the Pipe on that one! Chrome it Baby! We are heading out early Wednesday morning to hit the UP in anger, hopefully to get a mountain bike ride in before the event if the weather cooperates. That should be good preparation for coordination and endurance, which will be needed as the rally (or rallies actually in the regional portion - one Friday and one Saturday) won't end until Midnight or so Friday, and 7 pm on Saturday. See rally-america.com for more details on the event. There are over 50 cars entered for the Lake Superior Performance Rally or LSPR, and the weather should be great with cool temps and hopefully some rain. Nowicki's first rally in the UP, With Jim Garton Co driving, at the 1977 Press On Regardless in a Datsun 510. The second event for the Nowicki/Brandt/Slocum Rally Team for 2012 at Magnum Opus in the UP of Michigan is complete. Jimmy was away on a motorcycle adventure and couldn't make the rally, so with the help of Tim Maskus, rally co-driver extraordinaire Ben Slocum was extracted from his business duties, and the rally co driver couch to help the little Arrow get through the woods quickly and safely. The result, a SECOND place in two wheel drive and 6th overall keeps the 100% finishing record fully intact. The event, run on the longest daylight day of the year, was as nearly perfect a rally as one could hope for (other than one position out of winning) in the sense there were no "gotcha" or scary moments during the 75 stage mile NASA event. Some may say, "you are not going fast enough then". I say, "you are right". Well, some of the time. Most stages we set some pretty representative times for the car's potential, without tripping over ourselves, and a few early on, well, I might as well have been in bed sleeping. Early on the driver had to figure out the welded diff in the dirt, what the hell rallying was all about again since January, and listen to Benjamin Slocum esq. call the shots quite differently than I was accustomed to. First off, this was NOT a pace note rally. So called blind, the route book contained about 30 instructions per *average* 8 or 9 mile stage. Significantly less than a noted rally, significantly more than an old school blind rally. Hmmmm. And what the hell is a "medium" left when I am accustomed to numbers? So it took some time to figure it out. And figure it out we did. During the last half of the event, the Nowicki/Slocum Rally Team picked up the wick, and started posting some respectable stage times. Although not first, since that was rarified air of a BMW M3 that pulled 4 or so minutes on the 2wd field, we were pretty much second quick at the end of the event. The BMW had some mechanical issues that dropped it to third at the end, so the race ended up being between the Huebbe Brothers, John and Mark in their super cool souped up Beetle and ourselves trying to make up the deficit we allowed at the front end of the event. Not quite good enough for the win, but we fought best we could, and came away somewhat satisfied with second place. 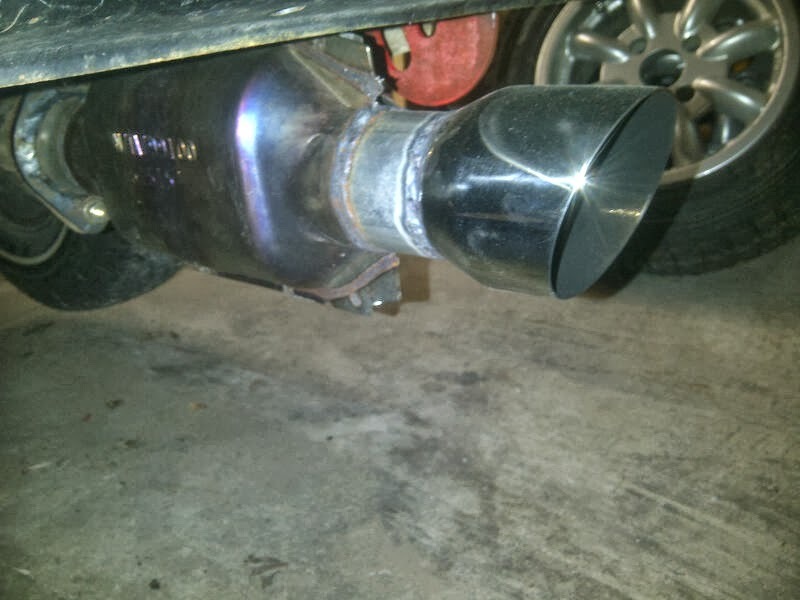 Technically, the car ran flawlessly, save for a cracked exhaust connector that nearly produced noxious fumes for the crew, and surely slowed the performance a bit. Otherwise, one quart of $2.00 20w50 Danica Patrick endorsed Peak motor oil and some tape on the left front tire to protect a slice in the tire, and we were laughing all the way. The rally's 12 stages were pretty darn quick, averaging us 53.6 mph for the entire event. Doesn't sound like much, eh, but from a standing start in soggy dirt and sand with maybe 120 horsepower, that is pretty darn tootin. Some sections of the event were pretty darn scary, nearly 100 mph on a long one mile plus straight with little room to the left or right between the bushes, but we made it safe and sound, and not a single scratch on the car. 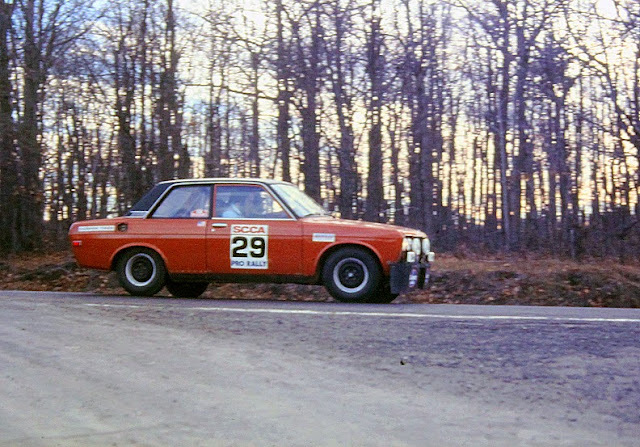 A lighter weight car by 80 lbs by removing the US spec big bertha bumpers allowed for better performance, mostly in the bumpy sections of the roads used for stages. Some of these were pretty bad, old school even, with lots of ruts and water splashes, just like the Safari or Ivory Coast, where Mitsubishi Lancers had their day in glory. Sorry Jodinger, we could only get second place, and will aim higher at the next event, later in the fall.